Sonos to discontinue sales of its Control remote | What Hi-Fi? With a certain inevitability, Sonos has today announced that it is to discontinue sales of its dedicated Control (CR200) remote for its range of music streamers such as the Play:3 and Play:5. Ever since it developed a bespoke app for PC, Mac, iOS and Android devices, the Sonos Control has effectively become redundant. "This move simply acknowledges that consumers now want to use the device they already own and love to control their system," says Sonos. "With free Sonos Control apps now available on the most popular platforms, including the newly redesigned Sonos app for Mac and PC, the need for a dedicated hardware remote controller no longer exists." 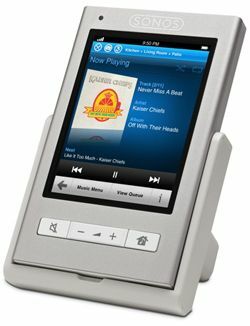 Sales of the Sonos Control will officially end on May 31st, 2012.